Tea plants don’t like to stand in water. 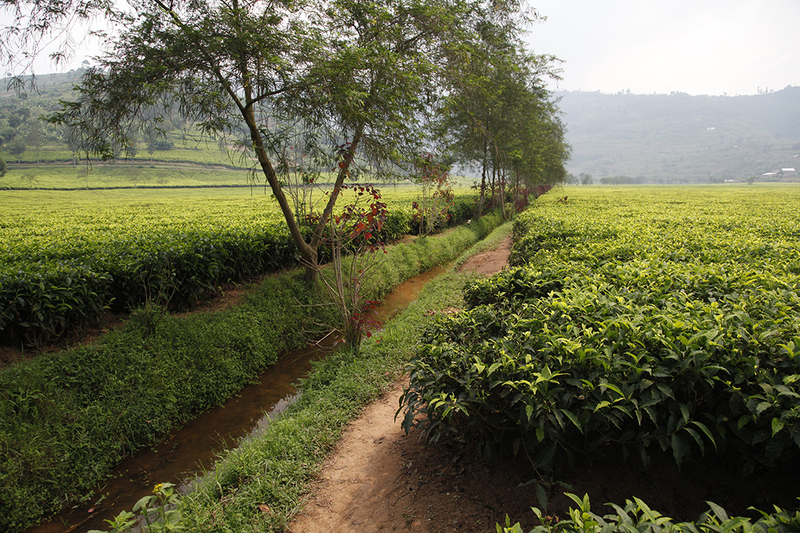 When tea is grown on flat land, like here in Rwanda, it’s important to dig out ditches so that the rainwater runs away and doesn’t linger around the camellia’s roots. What’s clever here is that the drainage is designed not only to allow water to run off, but also to irrigate the crops during dry spells. For the system to operate, you need to be near a reservoir, or a river, like here, so the water can be diverted into the channels. The frogs love it, judging by the racket they make, and a whole ecosystem thrives in these damp conditions, including colourful kingfishers, which I’ve startled into flight a few times.